Ehiz Blog: Of ALS, Ice Bucket and Giving. Of ALS, Ice Bucket and Giving. So, I was nominated for the ALS ice bucket challenge. I turned it down. There is a lady who is battling renal failure and needs roughly 9 million naira to save her life. There are 4 kids, who are struggling in university, with no financial support given their father's demise. There is a lady who got fired after having a baby, and she was the sole financial provider. There is a girl, who needs 200,000 naira to save her eyesight. All this in Nigeria. In Lagos. In Ikeja. I could go on and on. Poverty abounds. Even the good book says in the book of Matthew that the poor will always be in your midst. But then it goes on to say, that it is imperative we help them. As much as we can. And much more. And then some more. Else we may just run the risk of missing the reward of eternity. Sadly, we tend towards being more selfish than sincere. Selfishness which is linked to greed. My father used to make character links all the time. He would say - A Thief is Always A Liar. Think about it, it makes sense right? When someone steals, he for sure will have to lie to cover his tracks. For selfishness, he would say:- A Greedy Person is Always Selfish. Another no-brainer here. There is just something about wanting everything (greed) that lends itself to not wanting to share as well (selfishness). It is easier to on the internet bandwagon and hastag away. It is more convenient to post pictures and record 2 mins videos of support. Which is all well and good. But what the world needs is people who will follow it up with action. Reach into their pockets and help. Give. Today. Give Tomorrow. As much as you can. For as long as you can. 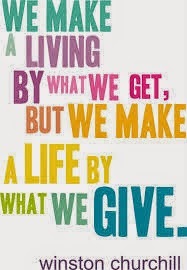 We do not have to be super uber rich to give. Time has proven that it is those with little that give the most. I wonder why that happens. Maybe it comes back to the link my Dad made. You do not give, so you do not get. And even if you get, you are so busy hoarding it, you do not get more. I don't know. I am not God, and I cannot claim he has spoken to me the mysteries of the human life especially the mysteries of giving, sympathy and compassion. But one thing is sure. Poverty Abounds. And it is our responsibility to help. To be our brother's keeper. And Give. Until it Hurts. And watch out for the blessings and fulfillment that comes with it.